KIEV, Ukraine -- Russia and Ukraine on Wednesday signed a raft of agreements including in shale gas exploration and nuclear cooperation amid concerns by Ukrainian opposition over increasingly closer ties with Moscow. 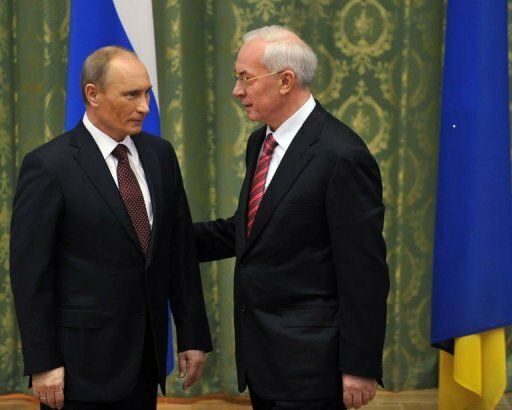 Ukraine's Prime Minister Mykola Azarov (R) welcomes his Russian counterpart Vladimir Putin. The accords signed by visiting Russian Prime Minister Vladimir Putin included a deal by Tvel, Russia's nuclear-fuel state producer, to set up a joint venture to build a uranium processing plant in Ukraine. The plant could start operation in 2013 and will have capacity to process 400 metric tonnes of uranium per year, according to a statement from the Russian government. "Ukraine will be building a plant to produce nuclear fuel and this plant will use Russian technologies," Tetyana Amosova, director of Ukraine's state concern Nuclear Fuel told reporters. She said the two state companies will create a joint venture in which Ukraine will hold a 50 percent plus one share. BP's Russian joint venture TNK-BP signed a preliminary agreement with the Ukrainian government to explore for shale gas in Ukraine. TNK-BP executive director German Khan told reporters ahead of the signing that his company hoped to begin exploring for gas in eastern Ukraine and the company could invest up to two billion dollars in the project over the next 25 years. In other deals, Ukrainian plane maker Antonov agreed to create a joint venture with Russia's United Aviation Corporation, a holding company for aircraft makers. Russia and Ukraine are stepping up cooperation in energy, aviation building and agriculture. On a visit to the ex-Soviet neighbour in April, Putin caught Ukraine's leaders off guard by proposing a merger between Russia's Gazprom, the world's largest gas firm, and Ukraine's gas company Naftogaz. After coming to power early this year, Ukrainian President Viktor Yanukovych has promoted closer relations with Russia. In April he agreed a landmark deal to keep Russia's Black Sea fleet based in Crimea at least until 2042, a decision condemned by the opposition as selling out Ukraine's national interests.